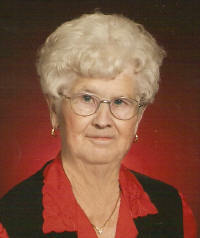 Henrietta A. Beckmann, nee Wolters, 85, of Aviston, died Thursday, December 31, 2009 at St. Joseph Hospital in Breese. She was born January 22, 1924 in Aviston to Bernard and Anna (Rakers) Wolters: they preceded her in death. She married Edward Beckmann September 29, 1942 at St. Francis Church in Aviston; he preceded her in death June 21, 1981. Also preceded in death by a daughter, Dorothy Ratermann, brothers, Bernard, Victor, Edward, Wilbert, and Raymond Wolters; sisters, Sylvia Becker, Edna Rosen, Mary Ann Becker, and Sally Barth; brothers-in-law, Otto Rosen, August Barth, and Alvin Beckmann; and sisters-in-law, Dorothy Wolters, Rosanne Wolters, Trudy Wolters, Florence Beckmann. Surviving is a son, Thomas (Rita) Beckmann of Aviston; a son-in-law, Dan Ratermann of Forsythe, MO; 10 grandchildren and 23 great grandchildren; a brother, Otto Wolters of Aviston; and brothers-in-law and sisters-in-law, Helen Wolters of Breese, Jeanne Wolters of Albers, Dolores Beckmann of Breese, Ray Becker of Bartelso, Albert Becker of Germantown, and Ray Beckmann of Germantown. Henrietta was a homemaker and a member of St. Francis Church and Altar Sodality, Daughters of Isabella Precious Blood Circle 718, Catholic Holy Family Society, and the St. Joseph Hospital Auxiliary. Funeral Mass of Christian Burial will be Monday, January 4, 2010 at 10:00 am St. Francis Church in Aviston with Fr. Daniel Friedman and Deacon Charles Litteken officiating. Interment will follow in St. Francis Cemetery. Visitation will be Sunday, January 3, from 4:00 to 8:00 pm and Monday, January, 4 from 8:00 to 9:30 am at the Moss Funeral Home in Breese. Memorials can be made to St. Francis church or Mater Dei High School and will be received at the funeral home. A prayer service will be held at 4:00 PM, and the Daughters of Isabella will pray the rosary at 7:00 PM Sunday at the funeral home.